Mystery Morsum Magnificat Magazine after 34 years solved. About 1730 AT (Dutch speaking time) on Saturday February 12, 1983, I felt like an incentive to create a CW magazine. The birth took place during a QSO With PA0RTW, Ome Bas, on the ONPA-QRG, 3553 Kc! Below a copy of a part of a copy of the original text. Rinus wrote: "Het Borelinkske" received the name: MORSUM MAGNIFICAT ! Editor....Below a copy of The original first B/W Dutch edition of the Morsum Magnificat Magazine MMM. SSN Morsum Magnificat: "About to send a message??" With the "dit dit dit dah dit dit dit dah" at the bottom of the cover page. I'm sure many in this SSN group know the origin of that Morse sequence adopted by Morsum Magnificat. Many decades ago, when I first got my ticket (in the UK) "dit dit dit dah dit" was often used as a pro-sign meaning "About to make a transmission". Nowadays it's usually given as meaning "Understood", with "Dah dit dah dit dah" used for "About to make a transmission". Why did Morsum Magnificat adopt this sequence for their cover? History of things related to CW is always fascinating! Fascinating, one of the questions I've also been asking. I remember hearing <SN>EET on 3553 kHz in the evenings where Dutch (PA) CW ops used to meet. These too are the editors and creators of Morsum Magnificat. I've asked in various forums and never had a definitive answer, even from PA's who questioned some of the Old Timers there. It appears to be that there was no particular reason other than the pattern or sound it makes. Perhaps one OM started it, and perhaps only one or few OM's used it. This is a cute way of sending VVVVVVVV and I sometimes close it with a V just to protect myself from any 0.001% probability of a first-ever-legal-test-case by the pathocratic authorities to prosecute an impecunious pauper on the basis of sending encrypted code, QSD, meaningless gibberish, or DQRM. I can then clearly defend myself as having sent an artistic VVV VVV VVV. I'm not sure if I picked up that "CW dance" from 3553 back in those days, or invented it myself?! That's the problem with having an appalling and very selective memory. I agree that <SN> has always meant, in all the uses I have come across it both in commercial and amateur radio as a sort of "ahem" or "throat clearing" i.e. about to send, or a mild form of "attention". To me it has always meant those things. BUT in LITERATURE ONLY, never experienced in practice, and if I remember rightly at some point even in ITU official international Morse, <SN> (or <VE> whatever) means "understood". Yet, the only use of understood I've notices, has been R or RR or RRR or QSL. R seems sufficient for most purposes! It would be nice to know which of the PA hams sent <SN>EET during those skeds, as I remember it, it was when first coming on frequency, and how many used it, and if it was indeed a "VV". As an aside, but somewhat related. I doubt anyone here used to monitor the "kharjiya" (foreign office) of the Republic of Sudan. Khartoum MFA and some embassies, most especially London and Washington, used CW, during Numeiris time. In fact, it appeared that Numeiri was constantly being instructed by CIA-MI6 what to do and say, as these instructions came from these embassies to Khartoum and not the other way around. Or again my poor memory, perhaps it was because Numeiri was already in USA and afraid to come back as Gen. Swar-el-Dahab was taking over. Anyway, the callsign was STL and the operator(s) had a rather unique way of sending (they used straight keys) a tuning in signal VVV, they sent it as ILLLLLLLLA so it sounded like L's. Many closed circuits or routine circuits developed their various habits. Those could be skeds and nets, national ship-shore operators, police forces, embassies etc. To give another example, in national ship-shore operator usage, Greek ships would frequently call SVA the Athens Radio coastal station calling call sign. But they rarely sent it as SVA. Most often it was sent as six dits followed by a K .....-.- all joined together as one string. Yet all that mattered was SVA knew it was being called. The founder of MM was Rinus PA0BFN (SK). I too was a member in the early 80s. Sure 3553 kHz was our QRG in those days. Don't know about the MM logo and why the SN sign was used. We also had a 'Who is Who in Telegraphy' booklet whitch I still have. I was in my early 20s then. And a good wat to learn more abt Morse. Durk, Can you / Would you scan that "Who's Who in Telegraphy" so it can be made part of the collection? I'm sure if you do not have a scanner that there are reasonable scanning services around HOL by now. If not, I feel sure I can find a Dutchman who has a scanner for you within reasonable time. Hi Lou, Thanks for the response. Yes, <SN> has always been a sort of "ahem" or "throat clearing" to me. That's certainly how it was used in QSOs back in the 1960s. As you say, although it appears in lists now as meaning "understood", I've never heard it used that way. Very interesting that you've come across and used the "<SN>EET" sequence. Apart from on the front cover of MM that's unfamiliar to me. Mississippi's Sissies is ALL dots in American Morse as is Horses Possies. SIX STEEL GREEK FISHING VESSELS SEEKING 66 FEET DEEP SEAS for a laugh. 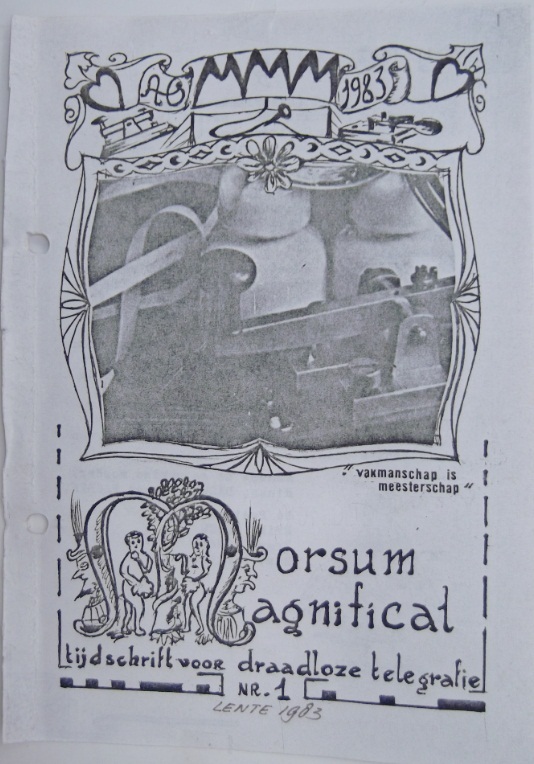 Editor.......Issue 1 of Morse Magnificat of the not Dutch issue! I remember about 8 years ago or so I went to a Radio Rally not far from here, walking along the rows of gear for sale I happened to glance below one of the tables and saw a box with 9 small blue files, I causally opened one up and found to my amazement it was full of Morsum Magnificat. I bought them of course and found I was short of about 12 issues which I soon was able to buy from other hams. Darrel, You forgot to include the little anecdote. 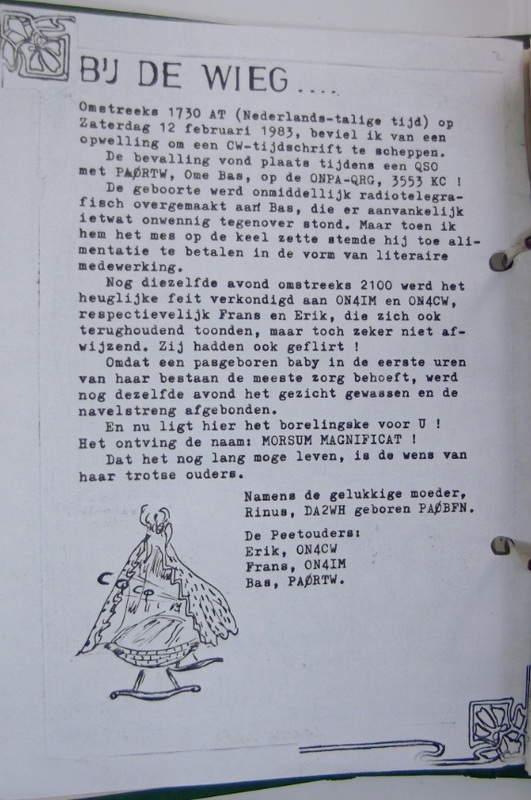 Durk PD0IDD / PE1GDX / PA3BYW i found you in "Wie is Wie in Telegrafie?" with two different pages. copy in the very last three Dutch Morsum Magnificat with date of issue 1988 under the names 88, 73 and 30. The Original Dutch MM Number 1 up to 20 and the non-Dutch issues have the following Morse Code at the bottom of the front. On the backside of the cover gives OM Rinus the names of the three OTs out the "De Peetouders"
I think you have deciphered it correctly! Thank you for this very interesting history and explanations! Yes, Jan, that's what it is. SN in American Morse Code is the numeral 3. Then having switched from International to American Morse the rest is easier. 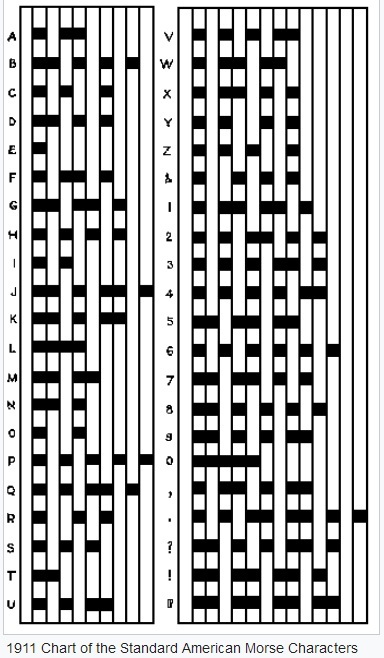 The second grouping isn't the letter I (this is a character identical in both American and International Morse codes,) but it one of those very unique characters in American Morse that have a special inter-element space of approximately 1.5 times the normal inter-element spacing. Characters using this are C, O, R, Z and &. Character L and numeral 0 use single dashes but of longer lengths that T which is identical in both codes at 3 units. L is about 7 units and zero was about 10 units but usually was just sent as a T or L, with the receiving operator having to discern what was intended. You solved, it Jan Pieter, Bravo! I love the explanation with "Three Old Timers", "3 O T" in American Morse. Thanks for those fascinating details. You've also answered another puzzle for me. For more than half a century, I've wondered why "es" is always used in CW conversations for "and". You've explained that "es" (or rather dit dit-dit-dit) is the code for an ampersand (&) in American Morse. I like the explanation from Rich (a secret code for members of the MM group), which is consistent with and follows on perfectly from Jan's explanation of the "3 O T" or Three Old Timers in American Morse. The reason it's used for & is that in International there is no such symbol, so the early USA radiotelegraphists having been examined in both American AND International (at the time "Continental) Morse used the American Morse for it. Likewise, I heard the old timers using these: prosign SX for USD $ and American Morse characters WO? - which is the American abbreviation for Who. The other American Morse procedure that still exists (at KPH San Francisco Radio at least) is sending the American Morse for "C" which sounds like International Morse IE. The procedure was to send American C and listen for a response from the nearest coast station. The only other artifact of old radio that I remember that was still in use at the end of radiotelegraphy commercial use was shifting frequency on the Medium Frequency band. Originally frequencies were given in wavelengths, 500 kHz was 500 kc/s then before that it was called 600m. Meaning that WLDU was calling on 600m or 500 kHz and wanted to go up to his working frequency of 426 kHz was 704 meters and 425 kHz was 706 meters, and they were both UP in wave from 600m. I love these (now sadly historical) details. Interesting! I wondered why I read that .. . (IE) is a way to first check if frequency is in use, to minimise QRM, rather than starting off with the very long QRL? or QSY? I also did not know that stations on 500kHz did this, I believe that must have been restricted mostly to USA. They did not do it in Europe, but then if they did, they would most always have had a dit in response! I think this is a great innovation for us to emulate: before doing QRL? or at the end of a QSO, start with just IE and if a E comes back, it's busy, if "I" then go ahead. If nothing, proceed with a ? if nothing with a QRL? I knew <SX> is $ but did not realise it was American Morse originated. A great opportunity for us all to be reminded, what is often forgotten, that we in fact use American Morse in most of our QSO when we send ES for 'and' and that it is actually '&'. 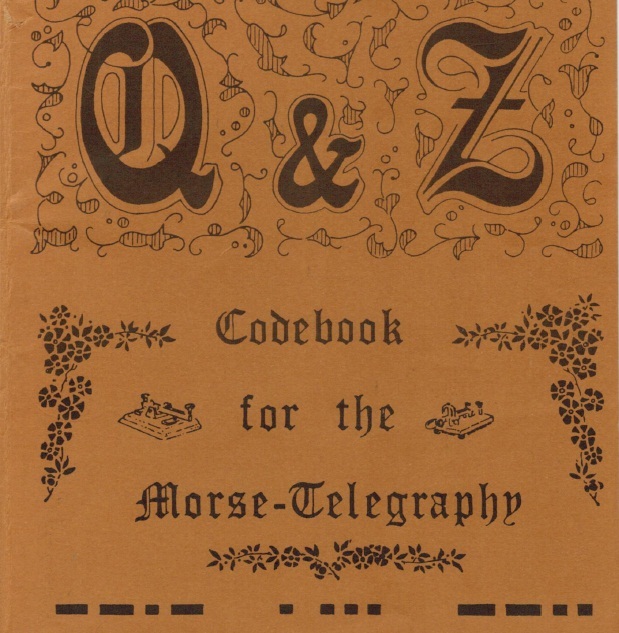 I have called CQ in American Morse many a time, and NEVER had a response, unsurprisingly!!! For my call sign it sounds like this, BUT note that the dahs are only twice as long as dits, they are VERY short, so it doesn't sound like the Morse we are accustomed to at all. So if you hear this, answer me, in International Morse, since I can ONLY call CQ in American Morse! Just to clarify as it was omitted in DR's clarifications below, UP 444/425 send by DAN or any other coastal station would mean going to transmit on 444 and listen on 425. Coastal stations had various fixed frequencies between around 418 and around 520 kHz generally each Coastal Station used only ONE working frequency, as these had been assigned to minimise QRM. E.g. Norddeichradio DAN was 444. Ships generally had the following choice of working frequencies, though they also tended to use mainly one (?) of them, although ALL also used 512 "5AU or EAU" 425, 454, 468, 480 kHz plus 512 kHz. 512 kHz was often used for ship to ship CW communication, and also as a working frequency if there was QRM on the normal working frequency(ies), but also, 512 took over the role of 500 during SOS periods: until "QUM" was sent (resume normal working, emergency has ended), those within range of the SOS would keep 500 clear so not only during the H+15-18 & H+45-48 Silence Periods, but total silence would be kept on 500 in that area, and 512 would become the new calling and announcement (TTT, CQ TFC LIST, Calling, etc) frequency. Now you know why we sort of emulated this system on 40m, some of us referring to 7050.0 as "5TT" and 7051.2 as "5AU". We could take this further and QSY to QSS 425 (7042.5), 454 (7054.4), 468 (7046.8) or 480 (7048.0) if we really wanted to have fun or even worse, use split UP 343/425 (I'm going to transmit on 7034.3 and listen on 7042.5) -- how many would keep up with us?! Thanks to Darrel AA7FV for starting this conversation with a question I'd asked before, but not until now received the satisfying explanation, as to why I used to hear "<SN>EET" on 3553 kHz from some Dutch CW hams and why that ..._. . . _ featured on the front cover of Morsum Magnificat Magazine. This in turn has led us all to further educational historic information some of which would even be useful to us today, notably the .. . ! In the United States of America, the FCC issued public coast stations TWO working frequencies. Mobile, Alabama Radio, WLO was issued 438 kHz and 436 kHz. WSC 460 was used by Bermuda Harbor Radio ZBM also. Yann F5LAW for the bandwidth in the Google Groups "SSN-ML" group. Above are all members of SSN SiteSwiperNet Group.